Have a tree ques­tion? We’ll do our best to answer it here. If you still have ques­tions, email info@treepittsburgh.org and we’ll help you out. Who do I call when street trees con­flict with sig­nage, build­ings, etc.? For City of Pitts­burgh res­i­dents con­cerned about a street tree, call 311 and request an assess­ment of the trees. Be sure to write down your inci­dent num­ber so you can fol­low up with 311 if nec­es­sary. You can also fill out the 311 form on Pittsburgh’s web­site (http://pittsburghpa.gov/innovation-performance/311.html). For res­i­dents out­side the city, call your Bor­ough Man­ag­er or Shade Tree Com­mis­sion. Who do I call when trees con­flict with elec­tric util­i­ties? If the tree is in con­flict with pow­er lines, call Duquesne Light or West Penn Pow­er. Who do I call when I want per­mis­sion to plant a street tree between the side­walk and the curb adja­cent to my prop­er­ty? For City of Pitts­burgh res­i­dents, call the City Forestry Divi­sion (412/665‑3625) to obtain the need­ed per­mits. For res­i­dents out­side of the city, call your bor­ough man­ag­er or shade tree com­mis­sion to find out what the tree plant­i­ng ordi­nances are in your town. Who do I call when I want a street tree to be removed from the side­walk adja­cent to my prop­er­ty? What if I want to pay for street tree removal or care of a pub­lic street tree? For City res­i­dents, call 311. Be sure to write down your inci­dent num­ber so you can fol­low up with 311 if nec­es­sary. You can also fill out the 311 form on Pittsburgh’s web­site (http://pittsburghpa.gov/innovation-performance/311.html). For res­i­dents out­side the city, call your Bor­ough Man­ag­er or Shade Tree Com­mis­sion to find out what the tree removal ordi­nances are in your town. Who do I call when my neighbor’s tree is infringing/damaging my prop­er­ty? Talk to your neigh­bor first. Have an ISA-cer­ti­fied arborist come look at the tree to deter­mine options. Often times arborists are well informed regard­ing prop­er­ty lines, laws, etc., and can advise the best course of action for pri­vate prop­er­ty tree issues. If your neigh­bor is unco­op­er­a­tive or hos­tile, call­ing your attor­ney may be the best bet. Tree Pitts­burgh does not con­sult or per­form work on pri­vate prop­er­ty trees. Who do I call when I see pub­lic street tree dam­age? If you wit­ness an act of van­dal­ism, call police to report the mis­de­meanor. Who do I call when I see some­one van­dal­iz­ing or remov­ing a pub­lic tree? Who do I call when a tree is struck by a vehi­cle? Who do I call for code enforce­ment? Call 311. Be sure to write down your inci­dent num­ber so you can fol­low up with 311 if nec­es­sary. 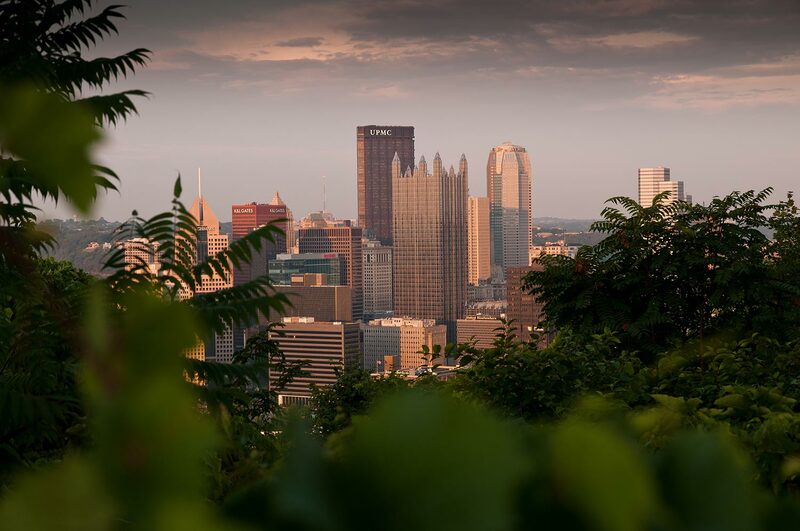 You can also fill out the 311 form on Pittsburgh’s web­site (http://pittsburghpa.gov/innovation-performance/311.html) or call your City Coun­cilper­son. To learn more about the tree codes, vis­it the City’s code web­site. For res­i­dents out­side the city, call your Bor­ough Man­ag­er or Shade Tree Com­mis­sion. Who is respon­si­ble for tree debris? For street tree debris: City res­i­dents, call 311. Be sure to write down your inci­dent num­ber so you can fol­low up with 311 if nec­es­sary. You can also fill out the 311 form on Pittsburgh’s web­site (http://pittsburghpa.gov/innovation-performance/311.html). For res­i­dents out­side the city, call your Bor­ough Man­ag­er or Shade Tree Com­mis­sion. For pri­vate prop­er­ty tree debris: City res­i­dents are respon­si­ble for pick­ing up tree debris on their prop­er­ty. The City holds year­ly yard debris pick­up days in the spring and fall. All mate­r­i­al should be in com­post bags or bun­dled in 4-foot sec­tions. No veg­e­ta­tion should be in garbage bags. City res­i­dents can also drop off yard debris at col­lec­tion cen­ters. More infor­ma­tion is avail­able on the City of Pitts­burgh web­site (http://pittsburghpa.gov/dpw/enviromental-services.html). For res­i­dents out­side the city, call your Bor­ough Man­ag­er or Shade Tree Com­mis­sion. Who do I call for tree issues on vacant lots and paper streets? For City res­i­dents, call 311 for vacant lots. Be sure to write down your inci­dent num­ber so you can fol­low up with 311 if nec­es­sary. You can also fill out the 311 form on Pittsburgh’s web­site (http://pittsburghpa.gov/innovation-performance/311.html). Please see the City of Pittsburgh’s pol­i­cy on paper streets. Who do I call regard­ing side­walks? For City res­i­dents call the Depart­ment of Pub­lic Works. For res­i­dents out­side of the city con­tact your local munic­i­pal­i­ty. Who do I call for per­son­al prop­er­ty dam­age caused by a pub­lic tree? For emer­gen­cies, call 911. Oth­er­wise, call 311 to have the inci­dent report­ed to the Forestry Divi­sion. Be sure to write down your inci­dent num­ber so you can fol­low up with 311 if nec­es­sary. You can also fill out the 311 form on Pittsburgh’s web­site (http://pittsburghpa.gov/innovation-performance/311.html). For non-City res­i­dents, call your Bor­ough Man­ag­er. I got a notice from the City that trees in front of my home will be cut down. They haven’t been cut down yet. What do I do? Call 311 to con­tact the Forestry Divi­sion. Be sure to write down your inci­dent num­ber so you can fol­low up with 311 if nec­es­sary. You can also fill out the 311 form on Pittsburgh’s web­site (http://pittsburghpa.gov/innovation-performance/311.html). Can Tree Pitts­burgh come cut down the tree in my back­yard? While Tree Pitts­burgh has ISA Cer­ti­fied Arborists™ on staff, we do not per­form pri­vate prop­er­ty con­sul­ta­tions. Please check the Penn­syl­va­nia Delaware Chap­ter of the Inter­na­tion­al Soci­ety of Arbori­cul­ture for a list of cer­ti­fied arborists (http://www.penndelisa.org/find-an-arborist) in the area. Can Tree Pitts­burgh come prune trees on my prop­er­ty? While Tree Pitts­burgh has ISA Cer­ti­fied Arborists™ on staff, we do not per­form pri­vate prop­er­ty con­sul­ta­tions. Please check our Arborist Mem­ber page for a list of cer­ti­fied arborists (www.isa-arbor.com/findanarborist/findanarborist.aspx) in the area.